From Vietnam, to Chile, to outer space, the third and final chapter of Read Outside the Margins is taking you to far off places! Travel across the globe with beautifully illustrated adventures, tales that will touch your heart, and stories that will show you the world as you’ve never seen it before. Grab your suitcase, take the quiz below, and get ready to explore new sights and cultures with a book just for you! I loved reading this sweet story with my students when I worked at a preschool. When Unhei arrives at school in the U.S. for the first time, she’s surprised to find that she’s expected to pick a new American name! Unhei’s journey to find home and comfort in a new land, while still cherishing her Korean heritage, will introduce kids to concepts like immigration, culture, and identity. I could not get enough of historical fiction when I was a kid -- there’s something magical about traveling back in time through text. Author Pam Muñoz Ryan uses her writing to tell a story inspired by her own grandmother’s past, moving from wealth and status in Mexico to poverty and hardship in a labor camp in California. Although the book has some serious themes, it remains an accessible and engaging read, and tells an immigration story that often goes untold. My heart swelled with each beautifully illustrated page of this story. Vivek Shraya tells the story of a boy who becomes enamored with his mother’s bindi. Rather than enforcing the strict gender code that bindis carry, his mother opens up the cultural significance of the bindi, allowing him to feel connected to his history and explore his sense of self. 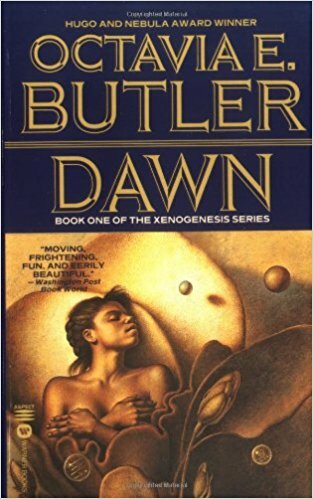 My absolute favorite kinds of sci-fi books are ones that reimagine what what aliens can be -- and Butler is the master of this kind of reinvention. Dawn takes place on a biological spaceship circling the moon where the Oankali aliens have rescued a group of humans from the crumbling earth. The book tackles complex questions of what it means to be human, how place interacts with one’s humanity, and what it means to consent in an environment of manipulation. It’s not a light read, but it will have you thinking for days after you close the spine. What do a nerdy teen, a middle aged social pariah, and a housekeeper have in common? It might be more than you think. Ten Women tells the stories of ten women who represent the different demographics of Chile who are brought together by their therapist to share their life stories. Through each tale, links, and threads are made between the women to paint a broader picture of the variety of unique lives of Chilean women. I’ve never been to Toronto, but Dionne Brand brings this bustling multicultural city to life in a such a real way that I feel like I’ve lived there myself after reading this book. This haunting and heartbreaking novel follows the interconnected stories of four twentysomethings caught between cultural worlds and struggling with their immigrant identities. Brand weaves separate narratives together so skillfully that these stories will stick with you long after the cliffhanger conclusion. Thank you for following us on our journey through Read Outside the Margins! If you're just joining us, the goal of Read Outside the Margins is to shine the spotlight on stories that students from all walks of life can connect with and actually want to read. You can read more about our mission here. From growing up, to family bonds, to trips around the world, we hope that you found at least one new story to make part of your life.